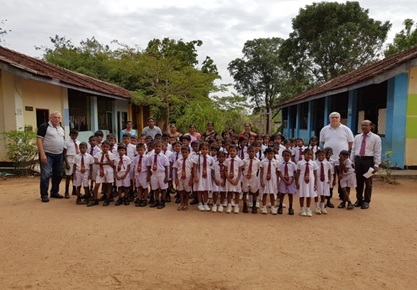 Sri Lanka Tourism, in collaboration with the Sri Lanka Convention Bureau, brought all smiles to the Thimbirigaswewa Primary School, Habarana , by organizing a special event in parallel to the visit of the SNAV delegates who toured in cultural sites such as Sigiriya , Dambulla , Polonnaruwa , and Minneriya during their 03 day post congress excursions recently. The delegates involved themselves in making a CSR donation to the school. The donation was made by SNAV Vice President Mr. Richard Soubeille and Mr. Jean Marc Roze , Secretary General to the principal of Thimbirigaswewa Primary School Mr. M. Dissanayake on 4th November 2016 during the congress. The Syndicat National des Agences de Voyages (SNAV) now referred as Les Enterprises Du Voyage (LEV) which was held from the 31st of October to November 5th, concluded on a successful note, with the participation of over 300 French travel agents. The Thimbirigaswewa primary school will also get pumping and drinkable water system for the school children, which by no means will be a facility which will be most important. They will also get a new playground, and in addition, if deposit is sufficient, a sound system and copier for the school administration will also be provided. The school children welcomed their visitors with much enthusiasm, for these children it was a whole new experience, which would benefit them in the long run. This is a good example of the benefits of tourism industry filtering to various layers of the society at large. SNAV is very keen to support more projects of this nature to uplift the standards and enhancing the livelihood of Sri Lankans in future, also spreading the message of humanity and compassion towards those who are less privileged.